Country & Eastern is very happy to announce the release of the album “STORA BLÅ” (“BIG BLUE” – and that’s NOT a gigantic computer company) with XYLOFONORKESTERN (THE XYLOPHONE ORCHESTRA) at a joint release concert with Spjärnsvallet‘s Again and Again on November 8 at Las Vega in Stockholm. 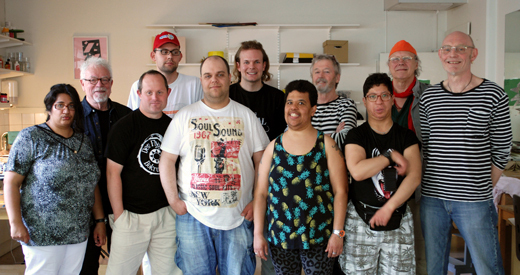 The Xylophone Orchestra’s Big Blue is a music-pedagogy project at a day center for people with cognitive disabilities in Stockholm. Christer Bothén has composed rhythmic/melodic pieces while working continually with the members of the orchestra. The result is a music of their own – music that emanates from the talents of the musicians rather than from their limitations. An album to love and enjoy! The Xylophone Orchestra + C&E staff.